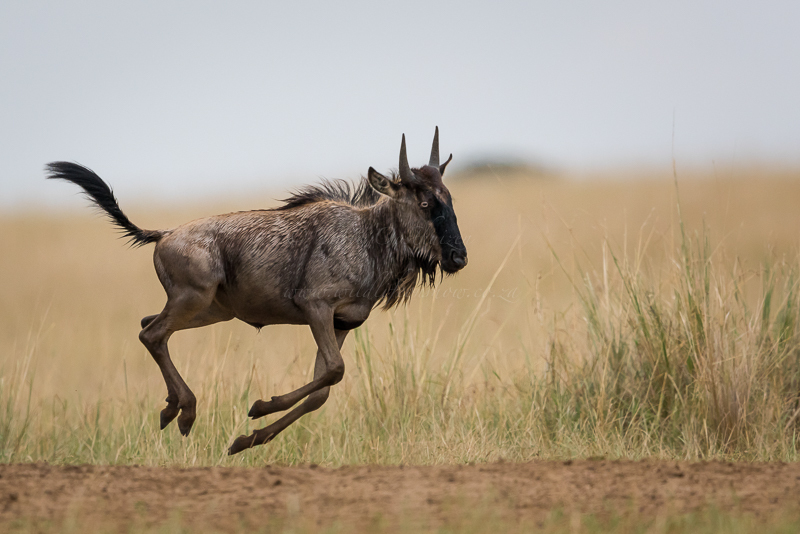 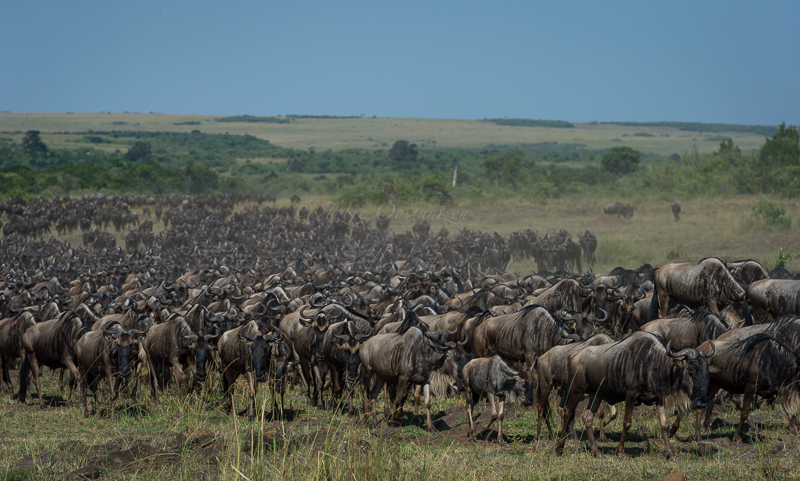 Every year millions of wildebeest and other antelope begin the migration to better grazing after the rains have fallen in other areas of the park. 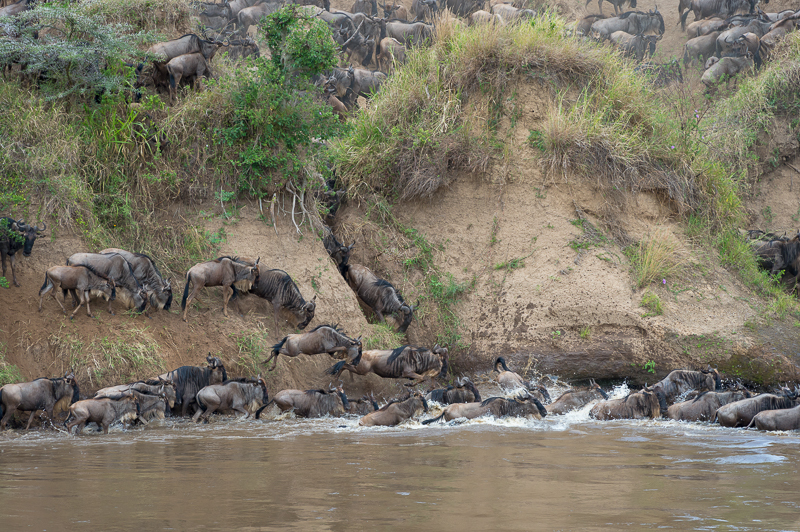 In the process they have to cross the Mara River where hundreds of hungry crocodile await their arrival. 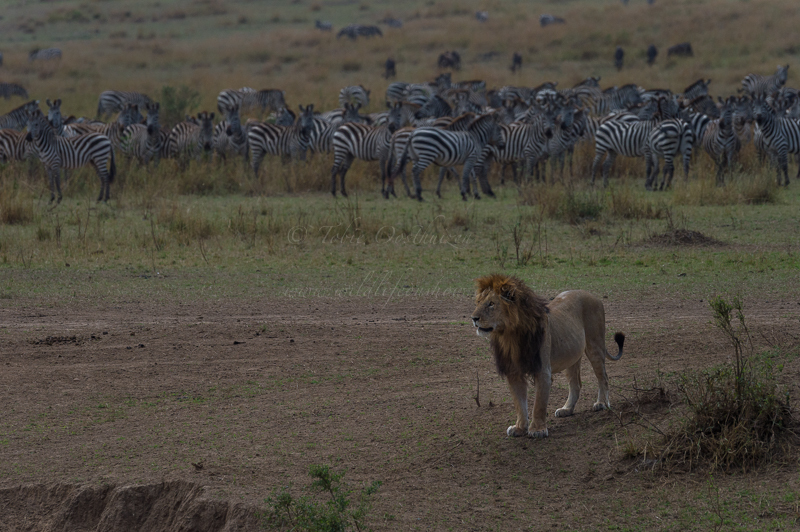 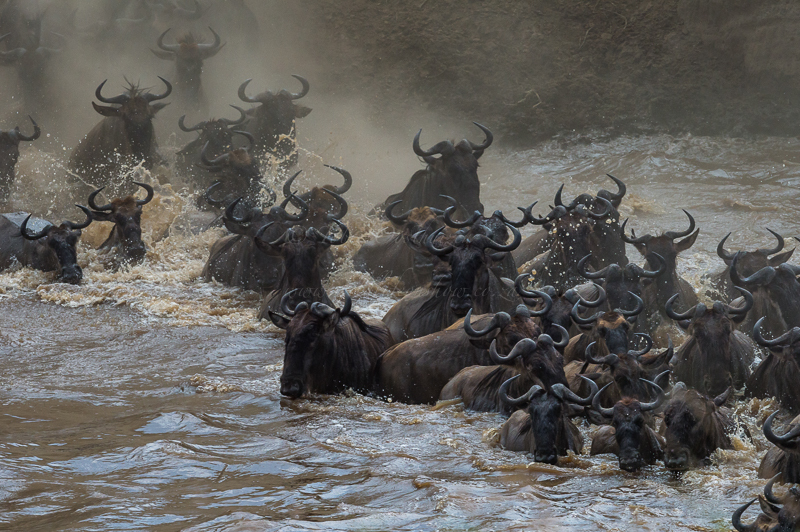 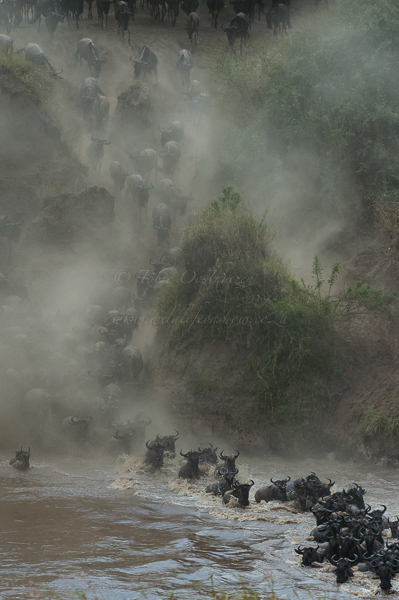 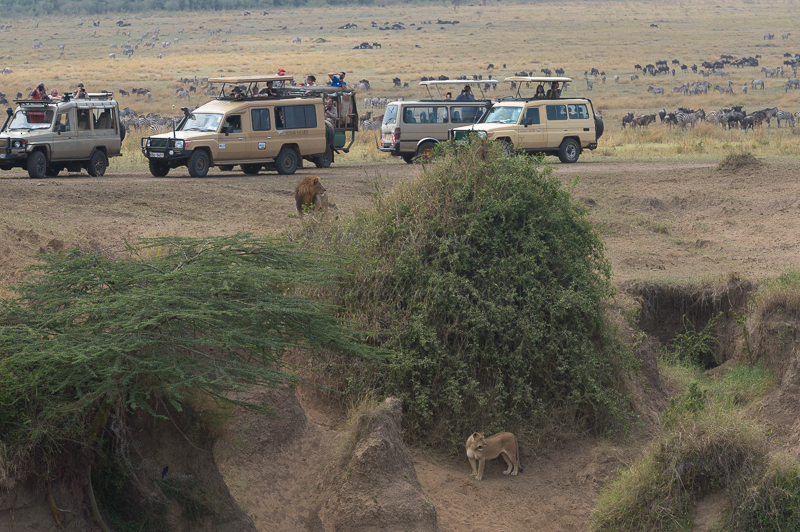 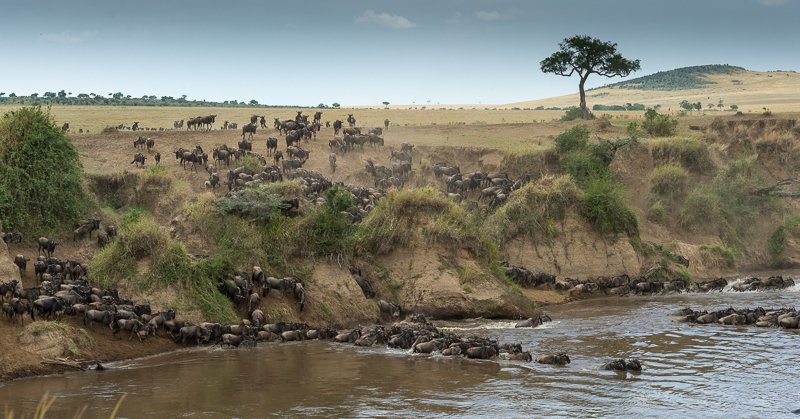 The wildebeest will gather in high numbers, push closer to the river and wait. 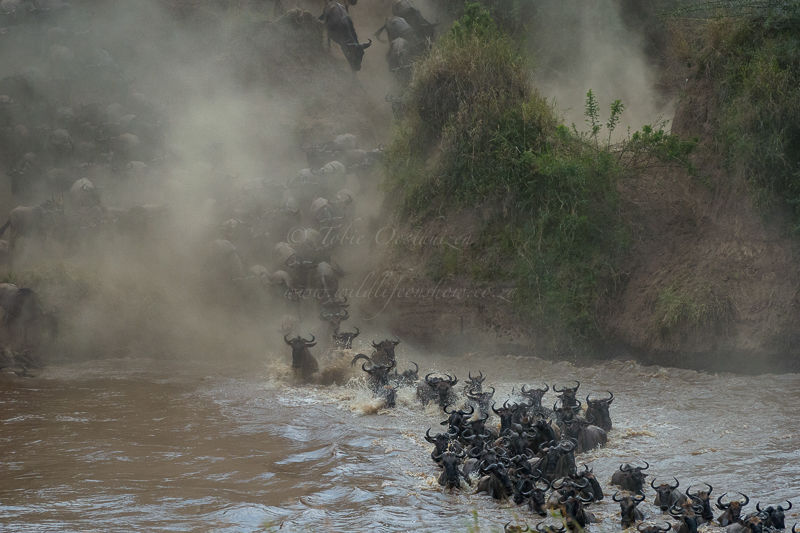 It is not clear what triggers the initial ones to take the leap but once it started, they all follow in a dusty frenzy. 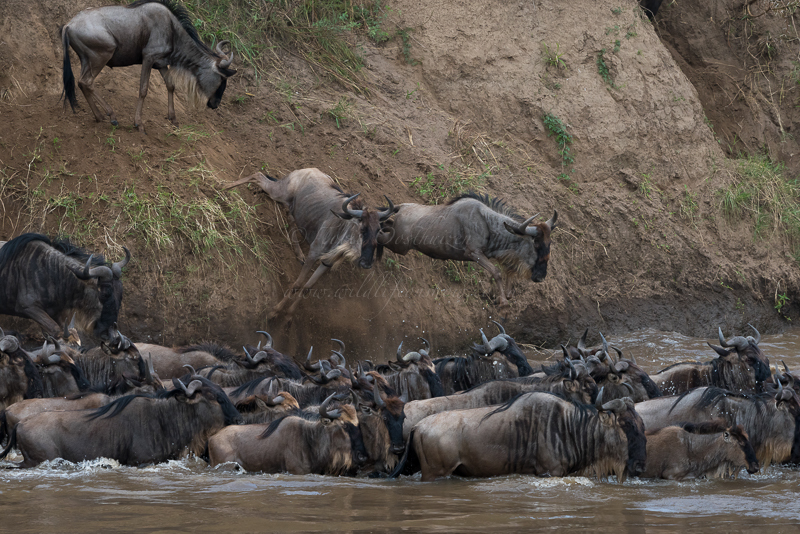 Some will jump from high up the river bank and splash down fairly hard in the river. 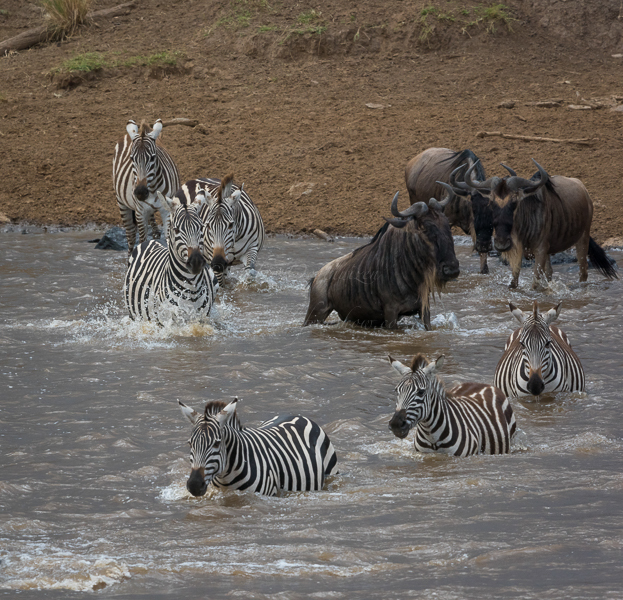 Normally if there are zebra present they will take the lead and the crossing can happen must quicker. 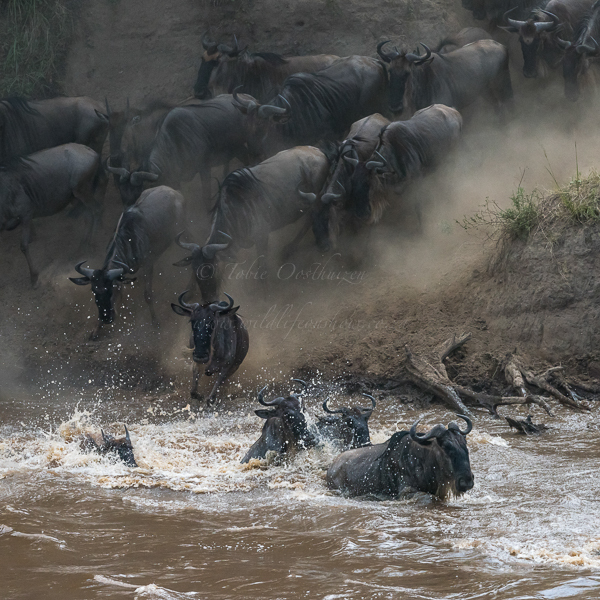 I have personally seen thousands of wildebeest building up, pushing at the river edge to just all of a sudden turn around and move away. 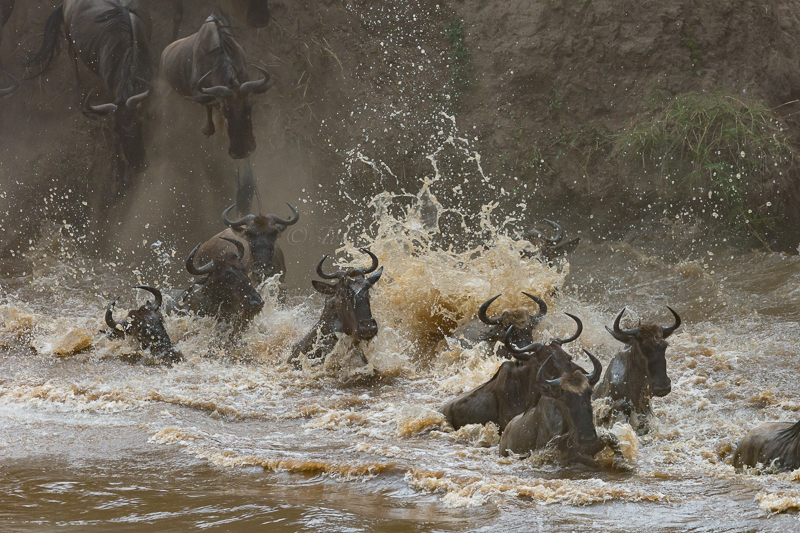 They may repeat this quite a few time or just cross on the second time. 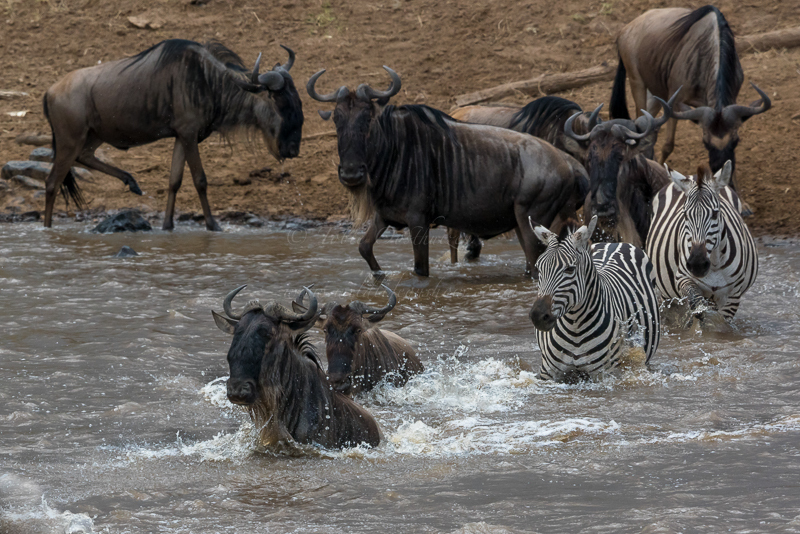 The presence of some animals on the opposite bank results in a higher probability that they might cross easier (either direction) to get to one another. 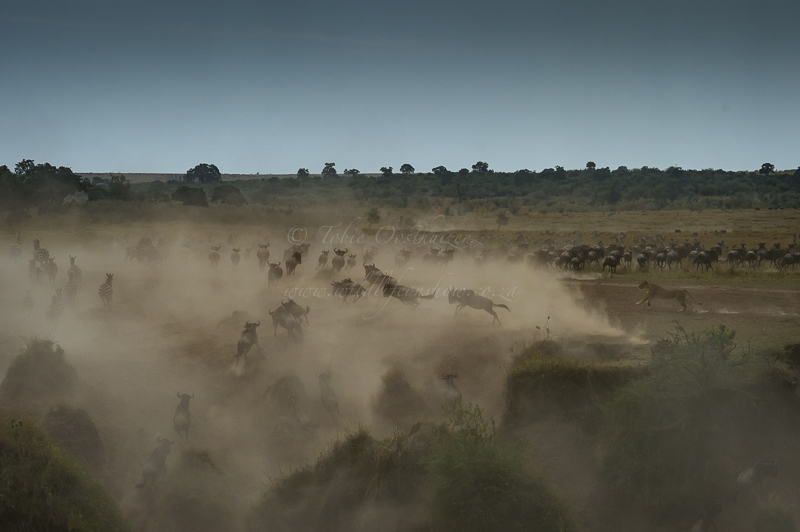 Then for the real excitement when thousands build up and eventually start to cross. 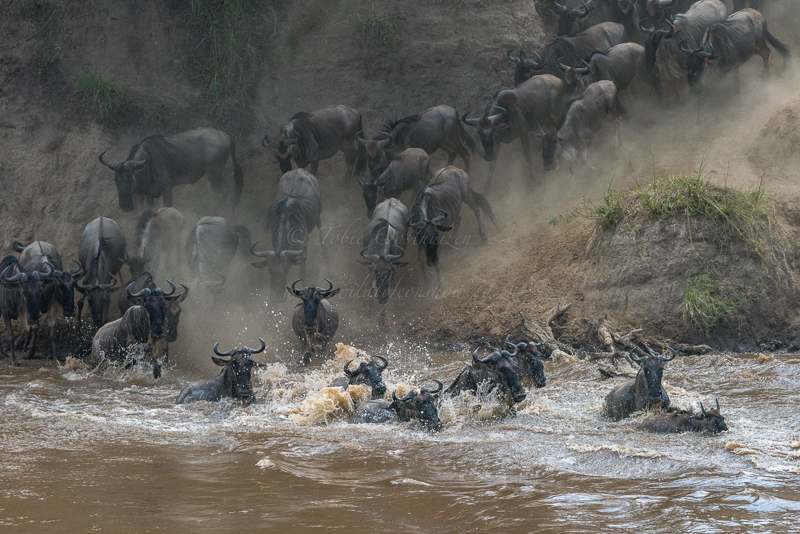 The noise they make, the dust generated and the presence of the odd predator trying to take a quick meal in the confusion of the crossing makes for a real noisy and dusty scene.The wildebeest just continue coming, jumping from high up the riverbank and plonking down in the river and quickly try to safely reach the other side in one piece.